SIAL explores: “Food delivery”, a danger to French cuisine? “There’s a real war for Paris going on.” So said Boris Mittermüller, CEO and founder of Foodora in France (an app and delivery service launched in 11 countries), to describe the new market in food delivery solutions in a recent article in The Verge. Already an established industry in New York and London, France was still lagging behind this retail culture until only a few months ago. But according to The Verge, it would seem they’re catching up. Now recognized as an in-demand niche market, France is seeing multiple express home delivery startups flourish. So much so that it’s becoming hard to choose one! The delivery of prepared dishes from services like Munchery, ready-to-cook kits with HelloFresh, fresh products from Amazon Fresh, or even grocery store products from Instacart are all disrupting the habits and customs specific to the traditional culture of French dining. Is this just another uberization to fuel the eternal debate between the “old” and the “new”? Or a real opportunity for the food and restaurant industry? In Europe, the response has been largely positive. Indeed, it would benefit from this Food Tech boom since - according to the latest ranking by the WSJ – two European companies, Delivery Hero and HelloFresh, are among the top “unicorns” (startups valued at over one billion dollars), thus making the food delivery business models giants of the new economy. SIAL puts this 2016 trend into perspective by looking at two radically different startups: UberEats and Frichti. “Paris was a no-brainer for the launch of the new UberEATS app and thus becomes the first city to offer UberEATS outside the United States and Canada. Paris is a great capital of gastronomy and culinary innovation, and the city is at the heart of the new wave of restaurant entrepreneurs,” explains Thibaud Simphal, General manager of France Uber." This fact is a real strategy in this highly competitive industry, where everything is a matter of timing and logistics. The challenge? To offer meal delivery in 30 minutes on average, with the possibility of express delivery in 10 minutes if the order is placed during the lunchtime rush hour and chosen from among 4 select dishes. So is it truly a groundbreaking offering? Not really, except for the “instant delivery” distinction: indeed, Deliveroo, for example, also offers delivery in 27 minutes, and so does Take Eat Easy (28 minutes). However, at a time when telecommuting and extreme mobility have become real trends, UberEats, with its semi-ATAWAD offering (for "Anytime, anywhere, any device") and its large fleet of chauffeur driven vehicles, seems to have been able to distinguish itself from Deliveroo and thus meet a real expectation for mobiquity. The fear of uberisation, however, seems to be little more than semantic parsing: in fact, the segmentation of the food delivery market has the emergence of another range of service platforms based on culinary well-being and health. It’s a trend that has also sparked the enthusiasm and appetite of the French people. A meal delivery service created by Julia Bijaoui and Quentin Vacher in the summer of 2015, this young food startup’s promise is simple: rebel against "junk food" with the offer of good, practical, affordable eating. As a result, gluten free options make an appearance on the menu and dishes are well-balanced and offered at an affordable price (around 10 to 12 euros for a meal consisting of an appetizer, entrée, and dessert). The offering has been a recipe for success. The company announced last March that it had raised €12 million – unheard of for a startup of its size and age. 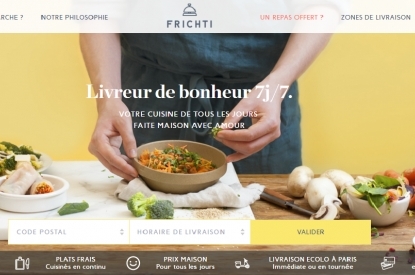 For Frichti, it was a business model created by the American company Munchery which ended up translating well to the French market, with other examples of businesses adopting this model include PopChef or Foodcheri. The main concept stems from the fact that everything is done internally: dishes are prepared and cooked on the startup’s premises. Today, with tens of thousands of customers in Paris, expanding abroad has become their new priority and a way of preserving the traditional French culture of a good, healthy, and well-balanced meal. It seems that food delivery is taking over our cities – without uberizing French restaurants – each one with its niche. In fact, it’s an additional market that can create synergy with the established market. A syndrome of the golden age of cities, food delivery isn’t done spinning its web or making people take notice. To be continued.